Diversity is part of what helps college campuses thrive. The blending of backgrounds, cultures and experiences creates the most innovative and novel ideas possible. Tech is committed to diversity and even has the Diversity Institute, which helps ensure compliance with equal opportunity policies. In addition to the Diversity Institute’s official policies, they organize and host the annual Diversity Symposium. This year’s symposium was held on Wednesday, Sept. 6 at the Global Learning Center and the Georgia Tech Hotel and Conference Center in Tech Square. 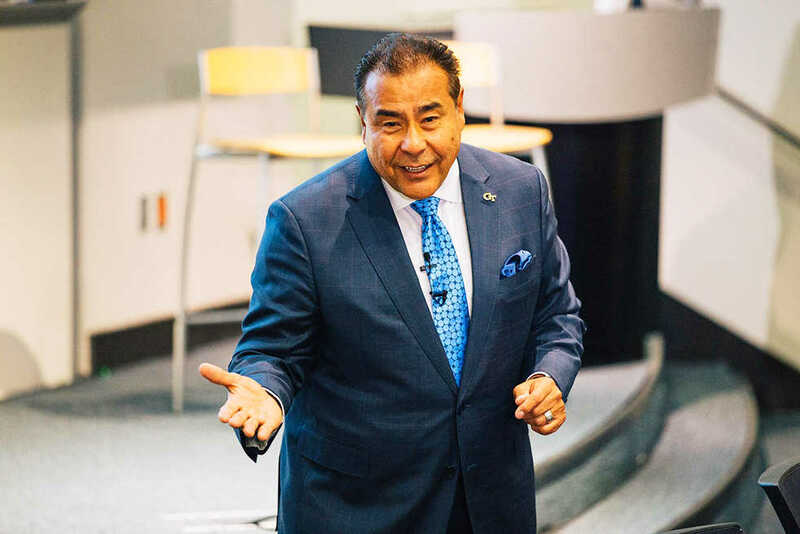 This year saw the ninth iteration of the symposium with guest speakers like John Quiñones, the host and creator of “What Would You Do?” The Technique spoke with Dr. Archie Ervin, the Vice President and Chief Diversity Officer for Institute Diversity. Technique: How has this year’s symposium differed from previous years? Ervin: Each year, the Diversity Symposium Planning Committee attempts to identify contemporary and germane diversity, equity and inclusion issues that can serve as the theme or focus of each year’s symposium. The 2017 Symposium theme focused on the impact of race and class on our efforts to build an inclusive and welcoming community at Georgia Tech and beyond. Given the national discussions about how to balance free speech with ensuring a welcoming community… the Diversity Symposium Planning Committee thought a day focused on these issues at Tech would provide a forum for a healthy discussion of these issues on our own campus. Technique: What is the major goal of the symposium and other events like it? Ervin: The goal of the Diversity Symposium and all community conversations is to provide a forum for civil, respectful discussion of issues that are often difficult to talk about openly but need to be talked about as a community. Our Georgia Tech values and support of a diverse and inclusive community is part of our DNA and we should be able to have discussions that allow all voices in the campus community to be heard. Technique: Could you elaborate on having John Quiñones, host and creator of the TV show “What Would You Do?” as a speaker for this event? Ervin: Mr. Quiñones’s approach and work on revealing the private thoughts that people have on issues like race, ethnicity and gender identity is done in a non-threatening way which allows people in the audience to become a part of the discussion and to think more deeply about some of the issues he raises. In fact, he was selected to be the first speaker of the day because his story-telling style allows his audience not to feel threatened and to participate in the discussion which allows more views to be heard on some of the difficult issues he identifies during his talk. Technique: What is the one main takeaway you want students and faculty to get from the annual symposium? Ervin: I hope that those who attended the Diversity Symposium realize that courageous conversations about race, class and other important personal identities we have as individual members of Georgia Tech are important to our aspirations to be an inclusive campus where diversity is embraced and is viewed as a strength and asset to our campus community. Technique: How do you suggest students, faculty and staff deal with intolerance in society and on-campus? Ervin: I believe that we all should engage these issues and seek to find ways that we can have our voices heard and listen to others whose voices may represent divergent perspectives. Engaging in these conversations will allow us to build linkages across the great diversity of GT and make us a welcoming community to everyone who is a Yellow Jacket.